Plated heavy metal casting secures door while allowing 2" of viewing or ventilation. Includes swing loop keeper, bar lock and installation screws. 3-7/8" bar length. Prefix U on factory number denotes new Defender Security packaging. Plated heavy metal casting secures door while allowing 2" of viewing or ventilation. Includes swing loop keeper, bar lock and installation screws. 3-7/8" bar length. Prefix U on factory number denotes new Defender Security packaging. Plated heavy metal casting secures door while allowing 2" of viewing or ventilation. Includes swing loop keeper, bar lock and installation screws. 3-7/8" bar length. Prefix U on factory number denotes new Defender Security packaging. Spring-loaded reinforcement lock, the Door Guardian protects against unauthorized entry by preventing lock bumping and lock picking while in the locked position. This lock is designed to withstand 8000 lbs. of force, and cannot be opened from the outside. Installs in just minutes using 3" hardened screws anchored to jamb, fits any size door, tamper resistant and child-safe design. Meets Texas building code requirements. Reinforces and repairs door edge and assists in preventing forced entry. 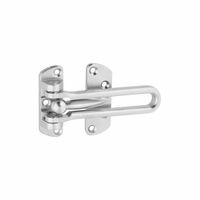 Used on wood or metal doors with mortise or drive-in latches. 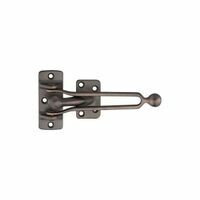 Accommodates key-in-knob locksets and deadbolts or combination locksets. Door thickness 1-3/4", bore 2-1/8", backset 2-3/8". 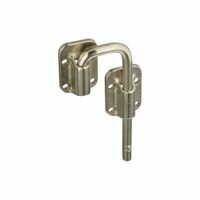 Reinforcer: 3-7/8"W. Includes solid brass door channel, (4) #10 x 1" combo screws, (4) #10-32 hex nuts, (4) #8 x 5/8" Phillips truss head screws.